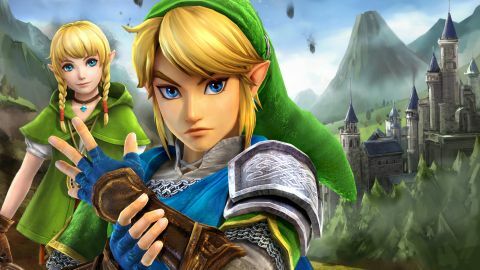 Hyrule Warriors Legends is a passable and entertaining Zelda-ised version of Dynasty Warriors, but the 3DS conversion has taken the shine off most elements of the game. Shoving the Zelda universe into Dynasty Warriors' mass-brawling action template was a polarising love/hate affair on Wii U. But whichever camp you find yourself in, on 3DS, you're essentially getting the exact same game (plus some minor additions), only not as good. It's no disaster, by any means, but if you have the choice and want to play it, do so on Wii U. Now that's out of the way, let's take a closer look. You play as Hero of Time, Link, to begin with, followed by an increasingly diverse range of familiar Hyrulian characters, as you fight swathes of enemies across open battlegrounds. Besides the slaughter, you'll be defending and winning keeps, completing objectives (defend this/kill that), finding special items and then returning to the core element: mashing the two main attack buttons a lot. Yes, yes, there are plenty of unique, useful moves hidden away in command strings, but pressing buttons kills lots of things in a very old-school kind of way. And 'lots' of things is an understatement. You'll probably kill a couple of thousand enemies within an hour's play, and since each battle lasts in the region of half an hour apiece, that means an awful lot of the game relies on the act of cutting a swathe through dense crowds of cookie-cutter foes. Demolishing a big group is always satisfying, but when there's a big group pretty much everywhere you go, things do start to feel one-note very quickly. However, there is enough variety in the combat to hold your interest. The game quickly reveals its depths as you unlock new combo attacks, specials, weapons and characters. If you want to spend time combining weapons, levelling your characters and maxing out their skill trees with badges, there's plenty here to enjoy. And once you do start injecting magic bar usage, special attacks, potions and other items into the action, the variety improves and the feeling of being able to dominate the battlefield makes you feel like Hyrule's true hero. You're simultaneously a master of combat and tactical genius, spinning several figurative plates at once. Even moreso in this 3DS version, in fact, as you can now switch between playable characters in an instant via the touch-screen, or order them where to go next and what to battle, remotely. Some of the characters are new for 3DS, and can then be transferred into the Wii U version once unlocked. Tetra and the King of Hyrule are both in, but the headline newcomer is Linkle – the 'female Link' - playable for the first time. She's likeable in a headstrong, totally oblivious-to-the-danger kind of way, and her attack style is flowing and fun thanks to twin crossbows and some surprisingly airborne combo moves, allowing you to rain down death from above. I'm not going to argue that Hyrule Warriors' gameplay is for everyone. And if the constant combat puts you off, you definitely won't be won over by the quality of the conversion. While the game manages to fill the screen with 3D enemies and cel-shaded elements (which is impressive, even for New 3DS), it looks noticeably rough compared to not just the Wii U version, but other 3DS games in general. Indeed, switch on the 3D and not only does the frame-rate plummet, the game actually starts moving more slowly. It takes more time to run across the field because the processor is groaning under the weight of having to draw all this stuff twice. It's a proper mess, even on New 3DS, and the 2D mode is the best way to play, by far. The rest of the conversion feels lazy. The cut-scenes haven't been re-rendered in proper 3D – instead they've had basic 3D relief added to parts of them. Basically, it's a fudge, and little halos of incorrect depth around key items in each scene make it look very strange. So combined with the frame-rate issues in-game, I wouldn't recommend switching on the 3D at any point. The rather scrappy visuals are offset by a simply superb score, which has made the transition beautifully, belting out hit after Zelda hit, with distorted electric guitars rocking up the already grandiose orchestral arrangements. Sadly, it's over-used during gameplay, the BGM repeating over and over until you turn the sound down, finish a level, or lose your grip on sanity. But returning to haunting melodies on the menu screens will make you pause to listen, especially when using headphones. If only the audio were a bit more dynamic in battle instead of ALWAYS ON AURAL CAPS LOCK, this could have been one of the best-sounding games on the system. There are moments where Hyrule Warriors Legends really gels. Firing up a super move in the middle of an oncoming crowd, triggering a slow-motion effect before sending an entire army tumbling some 30ft backwards looks superb. And the constant affirmation that comes from levelling up messages, mission complete fanfares and last-minute heals does make for an entertaining, pleasant experience. But this kind of game needs to be hyper-slick to stand out, and Hyrule Warriors Legends isn't slick. Passable, certainly, but not the stuff of legend. Description Hyrule Warriors puts classic (and new) Zelda characters into the Dynasty Warriors template of a mass-brawler. The 3DS version contains all of the Wii U game, plus new unlockables like Linkle - the female Link.